Lux Black Label ultra premium vodka is the first spirit to be launched by Lux Copper House. The vodka is seven times distilled using “only the finest British ingredients” and bottled on the historic Copped Hall Estate in Epping, Essex. The production site stands on the Copped Hall Estate, then known as the Royal Forest of Waltham, founded by King Harold in 1060, by the site of the Shrine to the Holy Cross where he sought blessing before the Battle of Hastings. The lands were granted to King Harold's canons who grew grains and distilled the 'water of life'. Later the estate became a hunting park for Henry V111. James Whittington, brand owner, Lux Copper House says: “The quality of our ingredients, the passion in our craftsmanship and our distilling heritage guarantees the consumer's satisfaction is long lasting. The brand is aiming for long-term success in exclusive retail, high-end bars, hotels, restaurants and clubs. 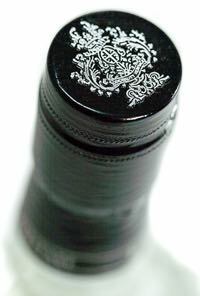 Therefore, the bottle had to exhibit an elegant classic appeal, and not become a victim of a fashion fad. The aim was to create a British iconic design to withstand the tests of time. The result is an Art Deco style bottle. Lux worked with designers at glass manufacturer O-I to create an extra flint glass art deco octagonal bottle and, to emphasise the traditional look, opted for the a luxurious embellished paper label. “Reverting to paper allows the graphics to leap out inviting the consumer to naturally run their fingers over the raised artwork,” explains Whittington. “The decision to retain the personal touch using a paper label was made possible by a local family-run printing company, Royston Labels, they have managed to bring the label alive. “Silver on black are our the flagship colours, enhancing the overall luxurious appeal, and the brand’s medieval antecedents are highlighted through the coat of arms, such as the coronet and cartouche surrounding the Union Jack flag. “We decided to finish the bottle with a cork and a tin capsule closure, the cork stopper is supplied by Bouchage Delage and the tin capsule by Ramondin. Essentra produced the outer presentation packaging. Lux Black Label 40%abv has an RRP £49.99.